The Highlands is a trendy section of downtown Louisville known for its historic homes, nightclubs, eclectic businesses, and upscale shops, restaurants and cafes. Highlands is located along a three mile stretch of Bardstown Road and Baxter Avenue, from the Watterson Expressway to downtown. 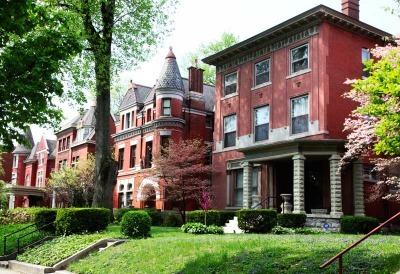 The streets that run east and west of Bardstown Road are made up of mostly single family homes and include some of the most expensive real estate in Louisville as well as more modestly priced properties. Some of the neighborhoods in The Highlands are: Phoenix Hill, Irish Hill, Cherokee Triangle, Tyler Park, Deer Park, Bonnycastle, Highlands-Douglass, Belknap and the original Highlands. There is another section of The Highlands referred to as Upper Highlands which have several small cities that have Sixth Class City status, such as Strathmoor Manor, Strathmoor Village, Wellington and Kingsley. Spring Drive runs through The Highlands and is the site of one of Louisville's most famous Kentucky Derby parties, The Barnstable Brown Party.